KUALA LUMPUR: A decision by the Road Transport Department (JPJ) to haul traffic offenders to court for seven serious offences during Chinese New Year travel exodus is not illegal and a move carried out within the perimeters of the law. JPJ director-general Datuk Nadzri Siron (pix) told theSun yesterday that apart from laws in the Road Transport Act, there are clauses that empower the Transport Minister to enable the authorities to charge traffic offenders in court. When told that there are certain quarters including lawyers who were quoted saying that the move was illegal and invalid, he said: "Lawyers may have their own views on the matter but we consulted our law experts before implementing the move. It has been accepted by the court of law and we have had no objection. Offenders have the option to defend themselves and it is the prerogative of the court to decide on the case." Nadzri agreed when asked if it was a desperate move by the authorities in reducing the high and rising road accidents and fatalities in the country. "We have tried almost everything. From enforcement to advice through campaigns but the figures continue to be alarming. When heavy vehicles are travelling faster than cars, youngsters riding motorcycles without helmets and using their mobile phones to send text messages, we have to act to save their lives and that of other innocent road users. All these are being initiated for the benefit and safety of the public in general." he said. Nadzri had announced last week that offenders caught for seven offences - indiscriminate use of emergency lanes, beating the red lights, mobile phone usage while driving, overtaking double lines, failure to fasten seat belts, jumping traffic queues and riding a motorcycle without a helmet - will not be issued with compound fines but will be hauled up to court. Road accidents and fatalities saw a steep rise last year compared to 2015. A total of 7,125 people perished in road accidents compared to 6,706 in 2015. There were also 521,466 accidents reported in 2016 compared to 489,606 the previous year. Over 62% of the road deaths were motorcyclists and pillion riders. 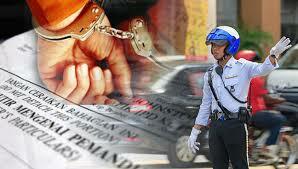 It was reported that several lawyers had argued that JPJ's decision to take traffic offenders to court for compoundable offences was unlawful and should not be enforced until laws are amended. Meanwhile, federal police traffic investigation and enforcement department director SAC Datuk Mahamad Akhir Darus gave the thumbs up to the RTD's decision to take errant motorists to court over the said offences. He disagreed with those who claimed the move was illegal and reiterated Nadzri's comments that the law allowed it. "Under Section 120 of the Road Transport Act, the powers to compound a traffic offence lies at the discretion of the relevant authorities and does not necessarily need to be automatic. We support the RTD's move." he told theSun. However, Akhir said enforcement by police during the festive season will continue to be in the form of compound summons but the fines will be the maximum imposed by the law - RM300. Ops Selamat 10/2017 launched on Friday by Inspector-General of Police Tan Sri Khalid Abu Bakar in conjunction with the Chinese New Year will be carried out until Feb 5. Akhir said apart from enforcement, police will focus on traffic control to facilitate the smooth flow of vehicles during the operation. "As for this Ops Selamat, there will be no static or omnipresence of traffic police. Our role will be service-orientated. Enforcement will go on in full force but we will be paying extra attention in ensuring traffic flow goes unhindered during the operation. We have identified 140 "black spots" that are prone to traffic congestion and we will train our focus on these areas during peak hours and provide assistance to road users. Over 5,000 traffic policemen will go on duty for traffic control, enforcement and investigations during this period. I will personally go down to the ground to oversee the operation." he told theSun.